The Seahawks went offense in the first round, but opted to go for defense in the third, selecting Rasheen Green out of USC with the 79th overall pick. The Seahawks did some more wheeling and dealing in the third round, trading with Pittsburgh to go from the 76th overall pick to the 79th overall pick, and acquiring an additional seventh round draft pick (220th overall) in the process. 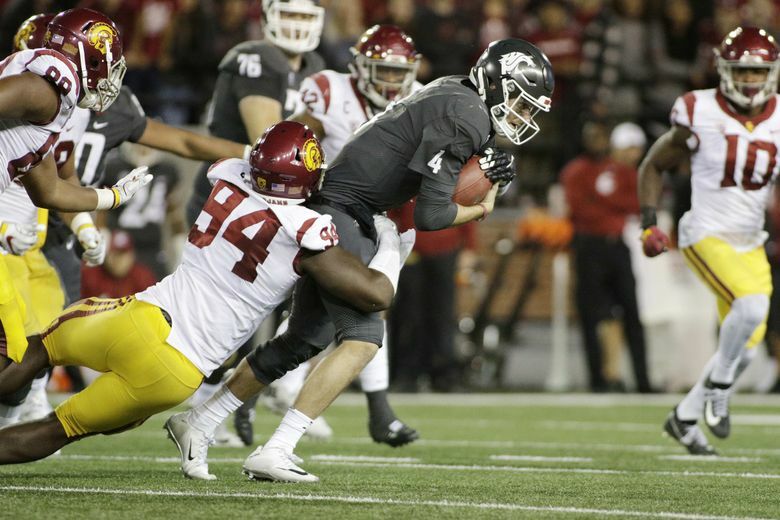 Seattle then selected USC defensive lineman Rasheem Green with the 79th overall pick. Here’s a look at who Green is. Green, a defensive end, left USC after a monster junior season to enter the NFL draft. He led the Trojans with 12.5 tackles for loss and was second in the Pac-12 with 10 sacks in 2017. With his unique blend of size, speed and strength, Green can play both defensive tackle and defensive end — which he did for the Trojans. That versatility was one of the reasons the Seahawks drafted him as they try to replenish their defensive line and pass rushing ability after losing Michael Bennett and Malik McDowell. Green said Friday evening in a conference call with reporters that the Seahawks have talked to him about playing both inside and outside on the defensive line. He said he’s a bit more comfortable on the outside, but that’s mostly because he played outside more frequently at USC. Green also said he likes to watch the play of J.J. Watt, Aaron Donald and Cameron Jordan. Green credits watching Watt and the Houston Texans on HBO’s Hard Knocks in 2015 with helping him realize the importance of watching football film as part of his preparation. Green, who will turn 21 on May 15, declared for the NFL despite being a semester shy of finishing his degree. His pre-draft process hit a hump at the NFL combine when a “wavy” MRI on his left knee drew concern. Green had torn his left ACL in high school, and had reconstructive surgery. He also had another procedure while at USC to clean out the knee. Green ultimately had a new MRI after the combine, and this was conducted by the Seahawks’ team doctor Ed Khalfayan. Khalfayan concluded that Green’s knee was fine, and that the “wavy” MRI might have resulted from Green moving his knee during the first MRI. The Seahawks clearly felt good enough with Khalfayan’s interpretation of the scans that they drafted Green in the third round. Green was a highly regarded five-star recruit coming out of Gardena Serra High in Los Angeles, and he opted to stay home to play for the Trojans over going to Oregon or Miami. He got on the field immediately as a freshman, but did not earn a starting role until his sophomore season in 2016. That proved to be his breakout season, and Green had 55 tackles, including 6.5 for loss. But he also made his presence felt on special teams, blocking two field goals that year.